Winner of Olive Magazine's 2018 award for "Best supermarket smoked salmon" Succulent Scottish salmon, cured, hung and kiln smoked for up to 24 hours with chestnut, oak and beech wood giving it a mild, sweet, smoky flavour. 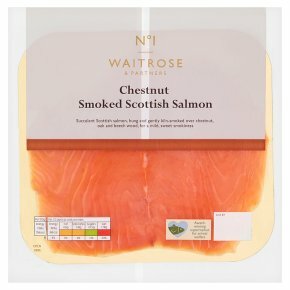 Felled in English forests, chesnut wood is blended with a small amount of oak and beech to give this salmon a wild, smoky flavour. INGREDIENTS: Salmon (Salmo salar) (fish) (97%), sea salt, demerara sugar.